A day of celebration has ended into a riot in the city of Paris. 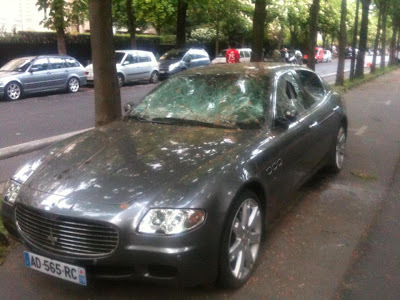 Just a couple of days ago the local football team Paris Saint-Germain has won for the second time in a row the national football championship and just like most time happens, the excuse to go out and celebrate turns out into a pretext to destroy everything you find. 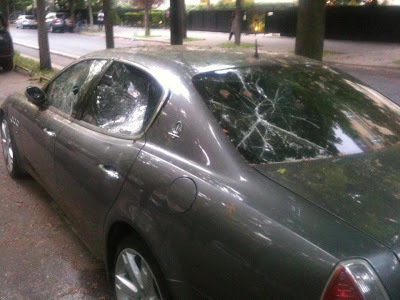 Over the day there have been a riot in the city and struggles against the police, and that's why I'm gonna show you how some vandals (hard to call them football enthusiasts) took aim to a Maserati Quattroporte by destroying the side mirror, the windshield and the side glasses. She's better here : http://www.autogespot.fr/maserati-quattroporte-sport-gt/2013/01/01 ! PSG just won their third title, its the first one since 19 years, not the second one in a row. I was there and the people who did this are NOT football fans, but they give a bad reputation to the club.